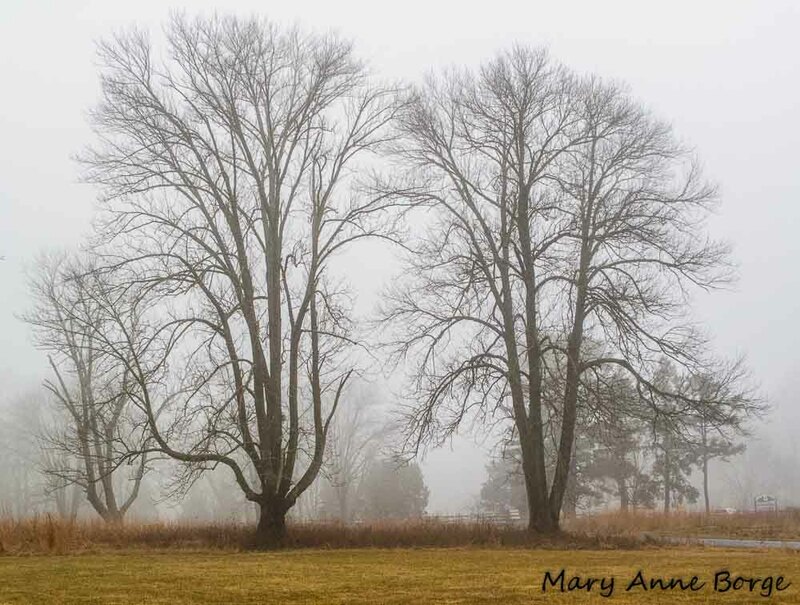 The weather this winter has been very variable, with warm temperatures and foggy conditions one day, followed by cold, wind and snow the next. 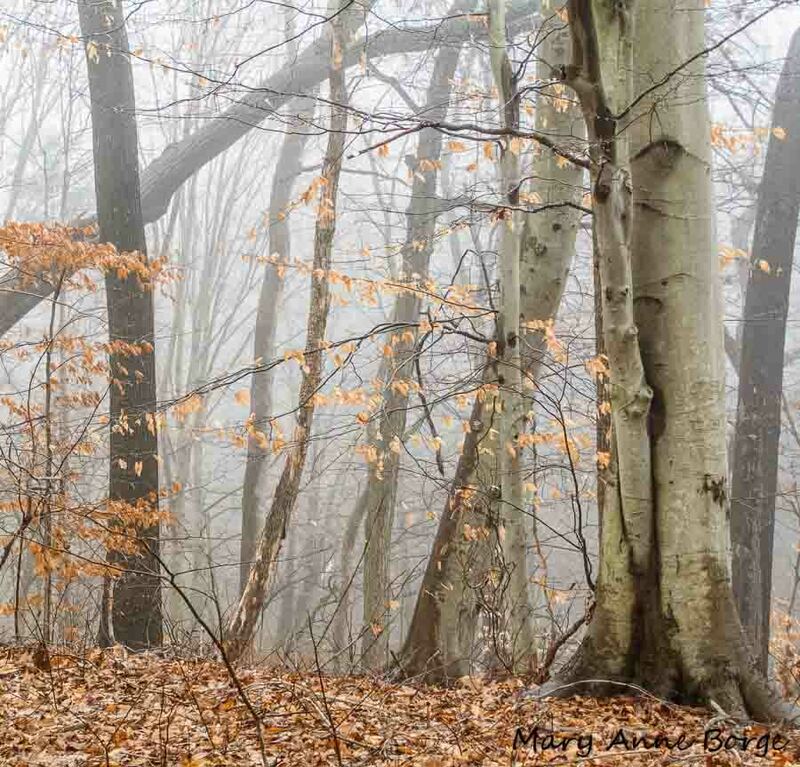 On one of the recent warm foggy days, I went for a walk at Bowman’s Hill Wildflower Preserve, just south of New Hope, Pennsylvania. The misty air exaggerated everything – silence, sounds, colors and images. 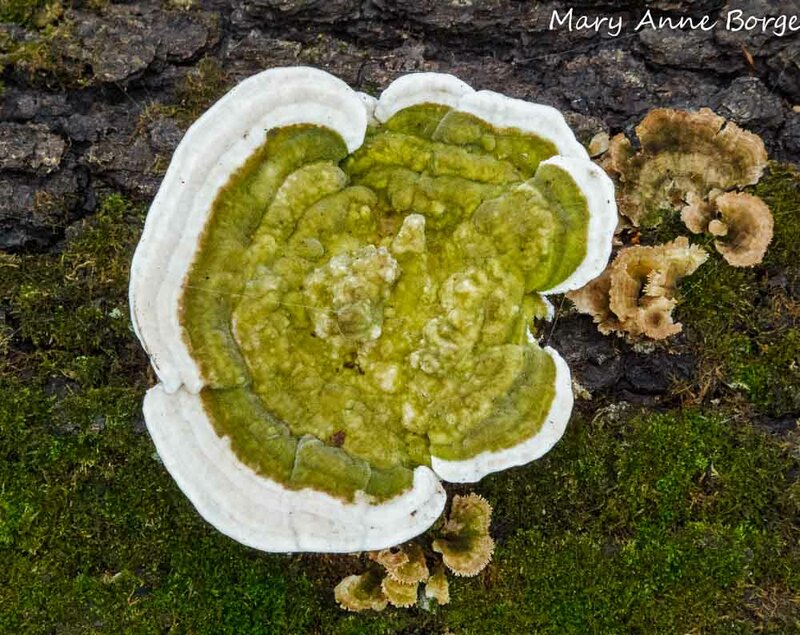 Soft light intensified the bright white and green of the Lumpy Bracket (Trametes gibbosa) mushroom, causing it to jump out and catch my eye. The changeable weather makes it challenging to adjust to the season, not just for people, but for plants, too. 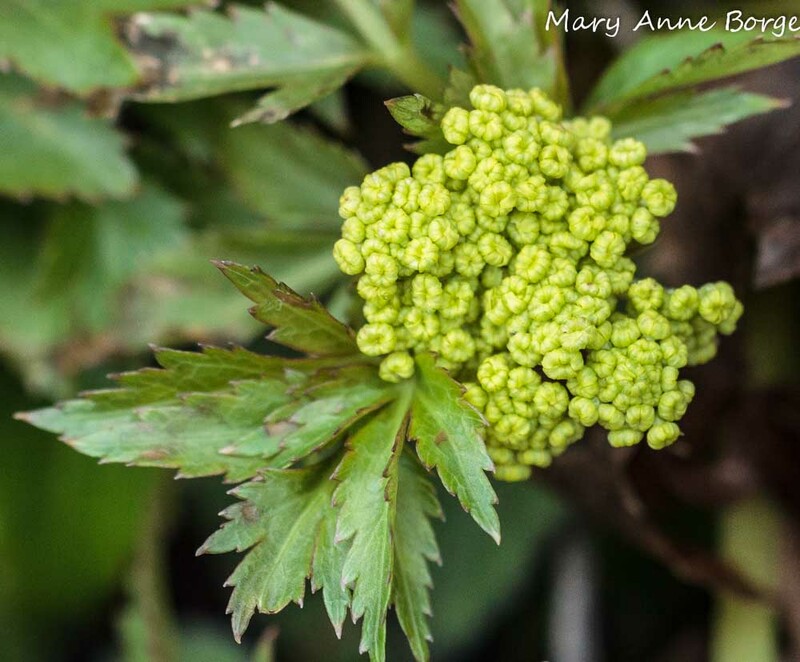 I saw Golden Alexanders (Zizea aurea) in bud, a plant that typically blooms in early May in this area in eastern Pennsylvania. A little scary! 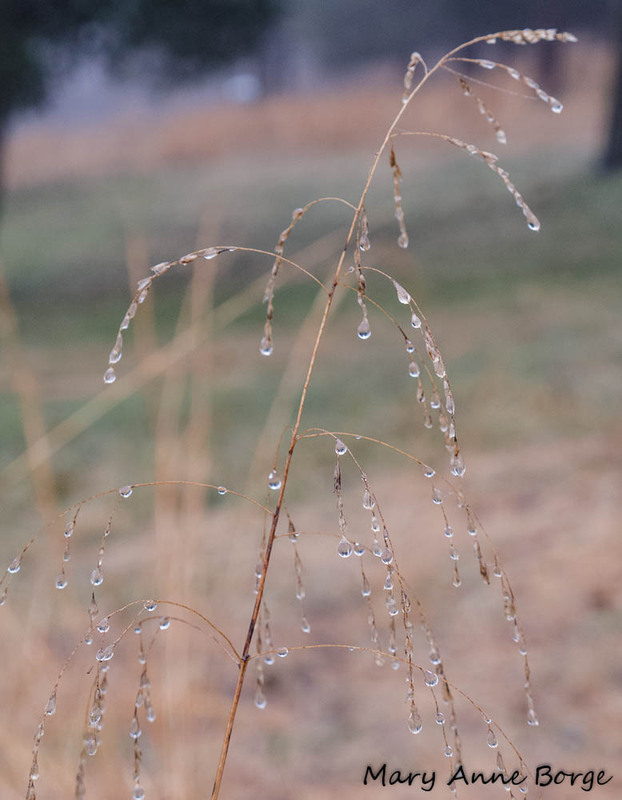 …where the grasses were beaded with water droplets. There were many signs of life in the meadow. 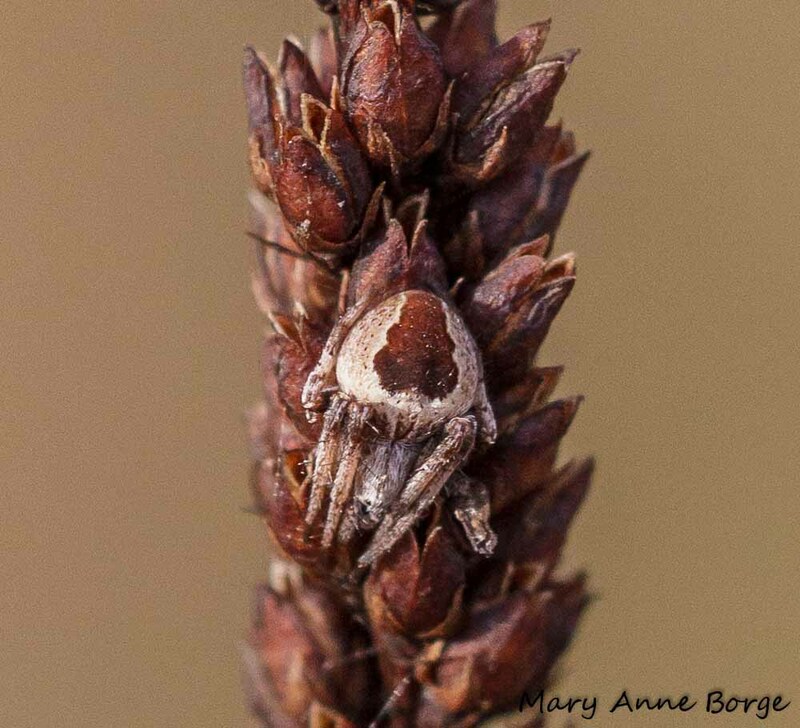 A spider successfully blended in with the dried fruit capsules of Culver’s Root (Veronicastrum virginicum). Chinese Mantis (Tenodera aridofolia sinensis) egg cases were very common. 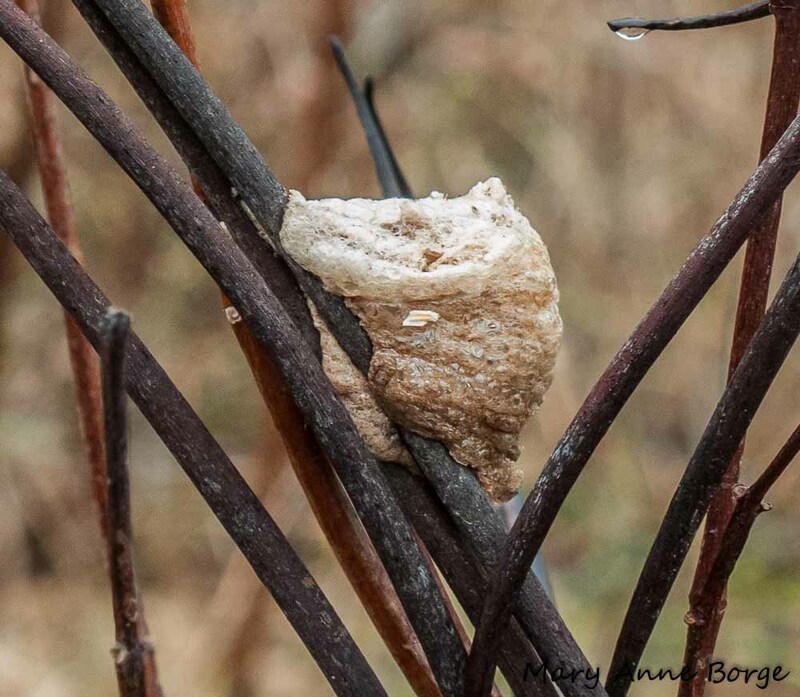 Much less common was the egg case of a native, the Carolina Mantis (Stagmomantis carolina). I only found one. 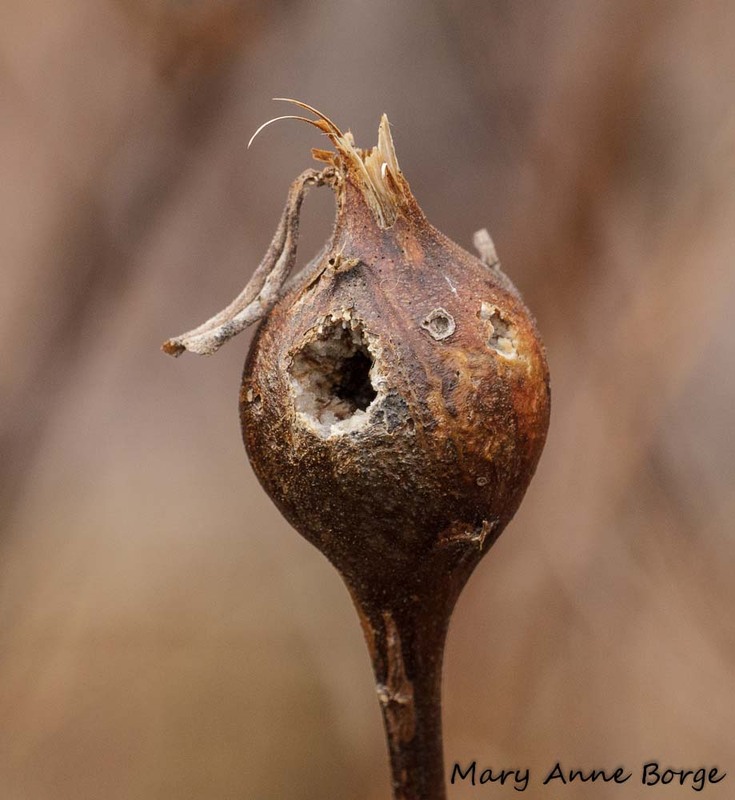 Goldenrod galls were evidence of insects overwintering. A gall is a growth that is a plant’s reaction to being used, or colonized, by another organism. Galls generally don’t cause any harm to the plant. The adult female goldenrod gall fly lays an egg in the leaf bud of the goldenrod before the leaves unfold. After hatching, the larva bores into the stem of the plant, and begins to eat. This stimulates the plant to generate additional nutrients and the gall tissue, a process that takes about three weeks to complete. 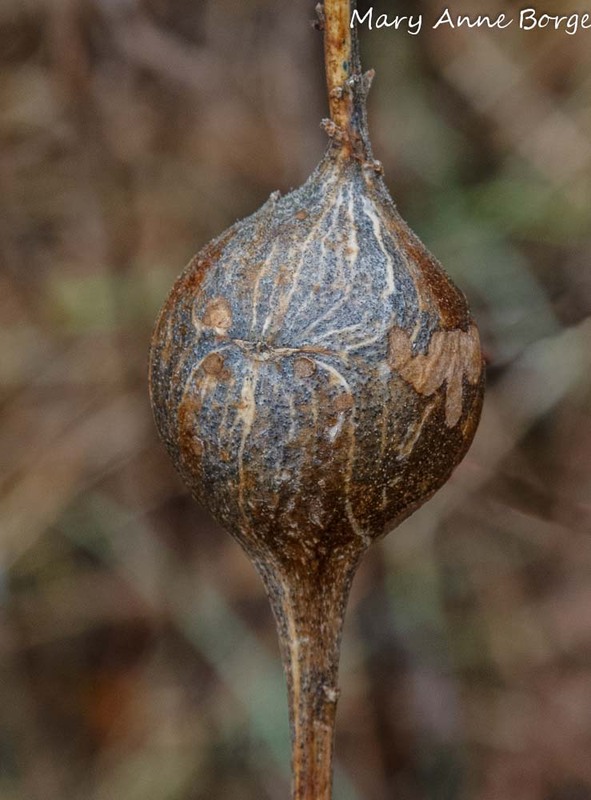 The gall provides food and shelter for the insect for the remainder of its stay. After spending the winter in a dormant state, called diapause, if the insect is lucky it will pupate in spring and then emerge as an adult from its winter home. But there are many dangers that could cut the life of the goldenrod gall fly larva short while it takes shelter in the gall. Other insects, including two chalcid wasp species, Eurytoma gigantea and Eurytoma obtusiventris, may eat the insect larva and take possession of the gall. 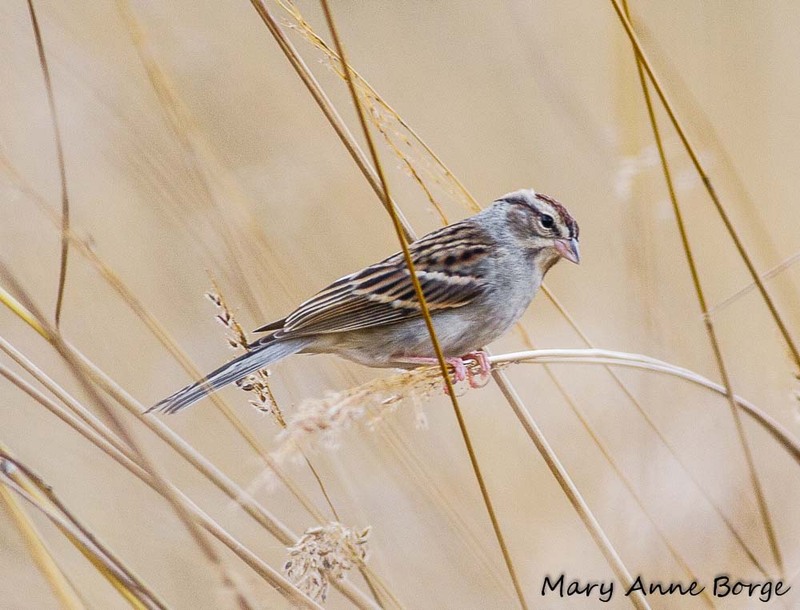 If the goldenrod gall fly larva manages to avoid these and other predators, a Downy Woodpecker or a Chickadee may make it a tasty winter meal. 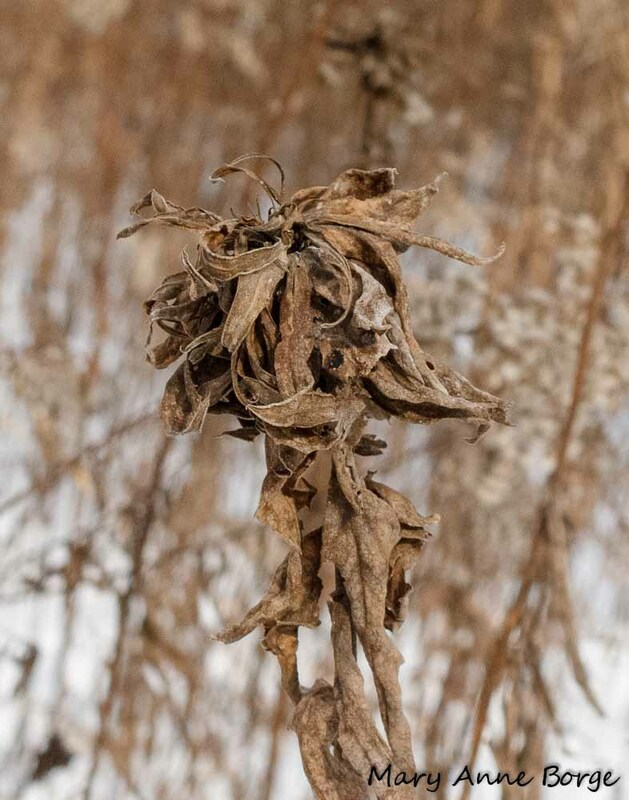 The goldenrod bunch gall resembles a flower, but it is actually a rosette of leaves caused by the entry of a goldenrod bunch gall midge (Rhopalomyia solidaginis) larva into the stem of its host goldenrod species, Solidago altissima. This stops additional upward growth in the stem of the plant, although leaves will continue to sprout, forming the rosette. Additional growth is through side shoots branching off from the stem below the gall. 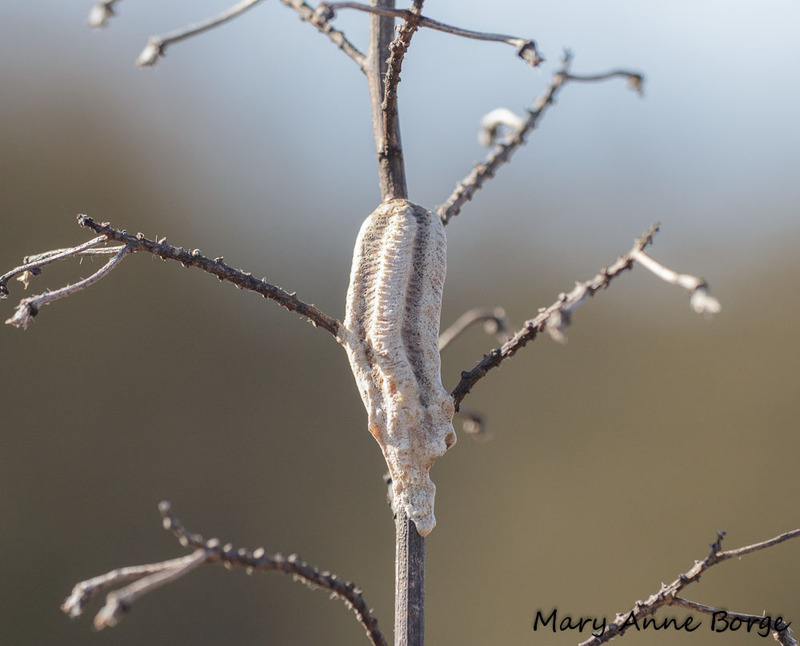 The presence of this gall actually increases the diversity of other insect species where it is present, by providing additional habitat for them. 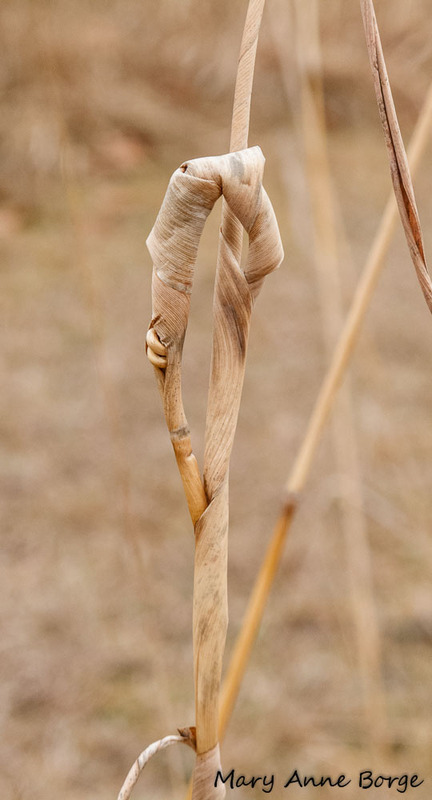 I found a wonderful, complex, twisted, origami-like structure made in the leaves of Indiangrass (Sorghastrum nutans) that remains a mystery to me. Could it be a winter shelter for a butterfly caterpillar, maybe a Pepper and Salt Skipper? 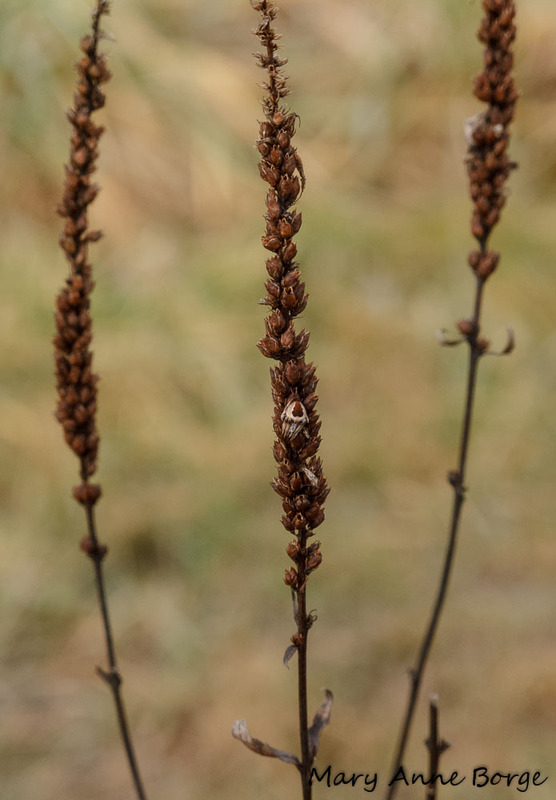 This butterfly is possible, although not common in this area, and its caterpillars spend the winter in rolled grass leaves, including Indiangrass. Maybe some other skipper? Or did a spider make this refuge? If you have any idea who could be hiding inside, let me know! If you are lucky enough to have custody of a meadow, you may be wondering how to maintain it without killing the critters that live there. To prevent a meadow from evolving into a forest, you will have to mow it. But this will disrupt habitat for the resident insects, birds and mammals. 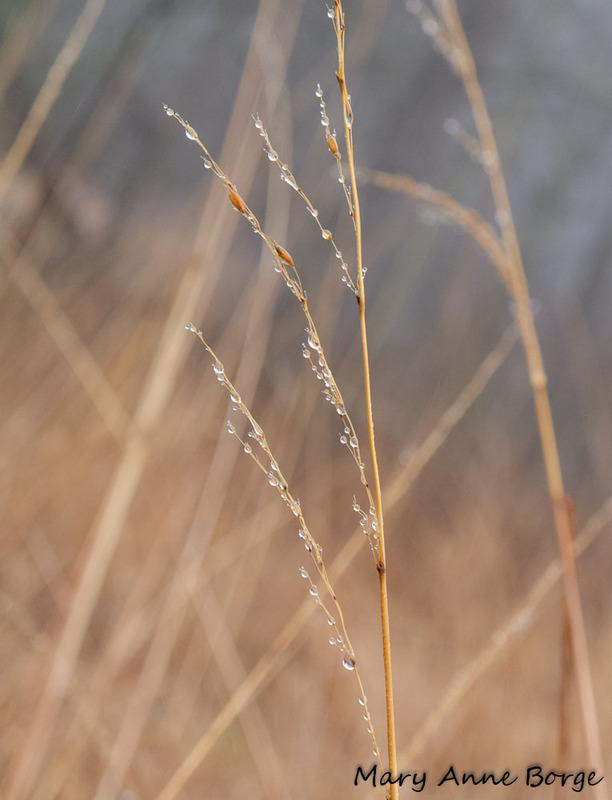 To minimize the damage, try mowing at a height of 12-16 inches, in a mosaic pattern if possible, and don’t mow more than a third of the meadow in a year. For the sake of birds and mammals, mow as late in the winter as you can. These techniques will help preserve life, and increase the diversity of the residents in your meadow. 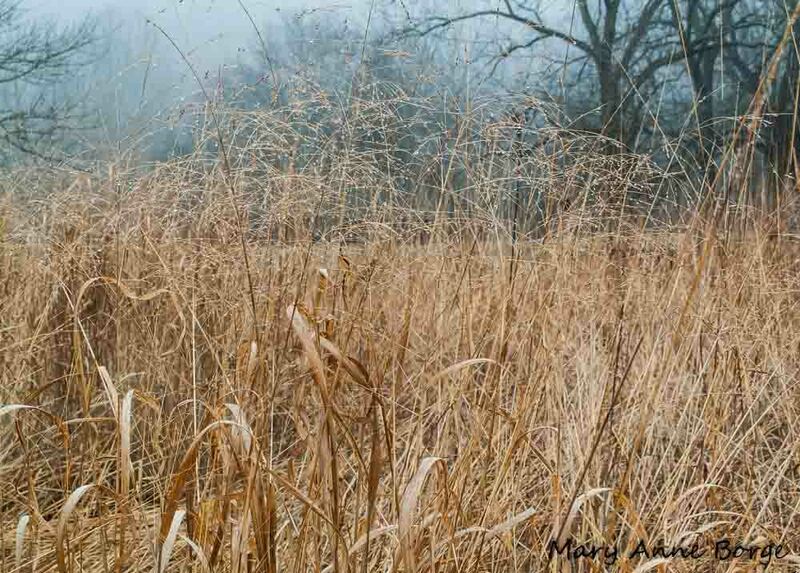 This entry was posted in Birds, Butterflies, Conservation, Gardening for Wildlife, Native Plants, Other Insects and Spiders and tagged Bowman’s Hill Wildflower Preserve, Downy Woodpecker, egg cases, Eurosta solidaginis, goldenrod ball gall, goldenrod bunch gall, Goldenrod gall, Indiangrass, Lumpy Bracket (Trametes gibbosa), maintain a meadow, meadow, mushroom, ootheca, praying mantis, Rhopalomyia solidaginis, skipper by Mary Anne Borge. Bookmark the permalink. Beautiful and informative. A wonderful way for me to learn. Thank you. Feels like spring is on the way even though it’s early. Even in my yard the daffodils are already about 6″ tall. Hard to imagine the future of the planet as it warms and how it will change the way plants and animals respond. Wonderful photos! Thanks, Bobbie! The scariest question to me is if plants are blooming many weeks earlier than normal, whether the pollinators on which plants depend to assist them with reproduction will be active at the same time. Many insects depend on a limited number of plant species for their food sources. If the dependent species aren’t on the same schedule, it doesn’t bode well for their survival. Most amazing photography, as usual! Beautiful post, love the life of a meadow. Thanks, Carole! No matter what time of year, there is always beauty, and something interesting to see.